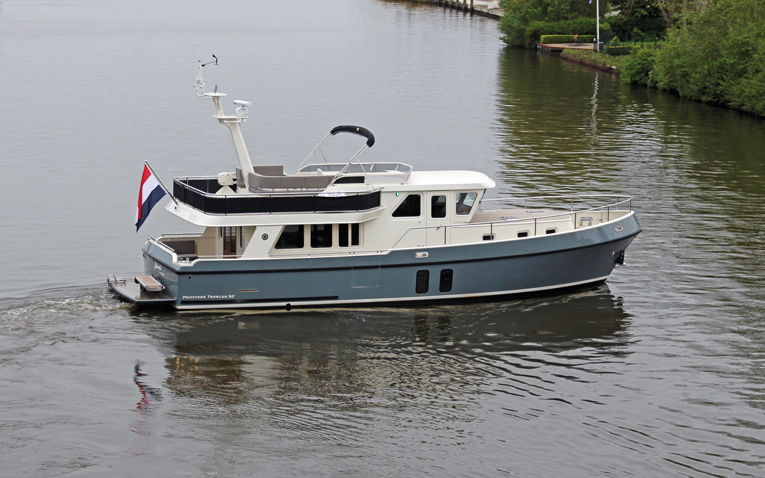 Mr Bol, owner of the beautiful Privateer Trawler 50 Bolwerk, did not take just anyone’s advice when looking for the perfect electrical system. After consulting his project manager Henk Boer, he was referred to Arjen van Gent, shore manager of the Brunel Team in the 2015-16 Volvo Ocean Race. The basic principle for the system was to implement the same Lithium Ion Mastervolt technology that was used on the VOR boats. Against this background, the owner and builder together sought out the most compact solutions which would nevertheless provide ample independence from grid power. Another important user requirement was fast charging time, which would keep the running time of the generator to a minimum: this led to the choice of an all-electric on board system. Based on the recommendation of Arjen van Gent, Bolwerk’s owner was quickly convinced that all Li-ion batteries, right down to the one powering the sternthruster, should be made by Mastervolt. A state-of-the-art electric system that is convenient to monitor and operated intuitively, including links to the B&G navigation screens. High charging capacity: the entire service battery bank of six MLI 24/5000 (linked in parallel) charges up to 100% from the shore or from the generator in a very short time. Limited running time for the generator: two Alpha alternators power the connected consumers in parallel with the battery charging, further reducing the time that the generator is active. The charging sources receive all required battery information from the Lithium Ion batteries. This system is conceived to preserve the battery: overcharging is prevented and even cable losses are monitored and compensated during charging. This results in a 100 % efficient load every time. To save space, the battery charger, inverter and AC transfer system are combined within one casing. Due to the large loads, battery voltage is 24 V. n Navigation, system data monitoring and power electronics are operated via a single display. 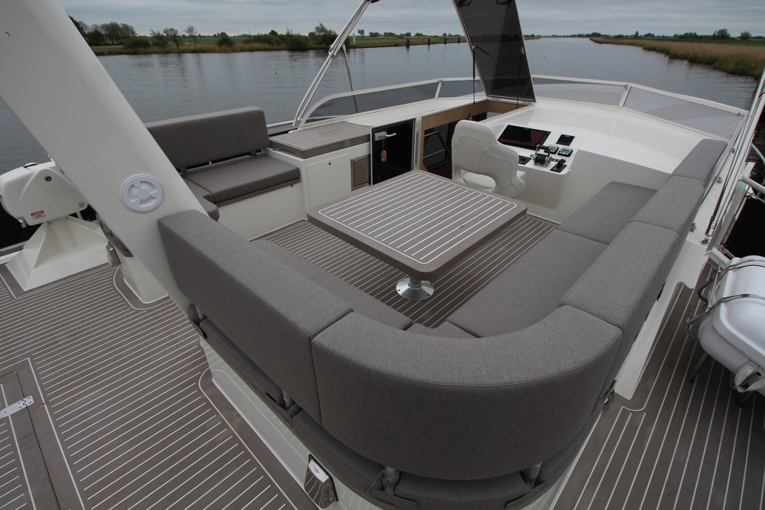 The system on board the Privateer Trawler 50 Bolwerk comprises three Mass Combi Ultras connected in parallel, giving a total inverter capacity of 10.5 kW and total battery charge of 300 amperes. Mastervolt’s Mass Combi Ultra is a battery charger, inverter and AC transfer system in one. All energy sources, such as the generator, shore power or batteries, can be connected. The Combi regulates and distributes power automatically, seamlessly connecting the available power sources. This ensures that the batteries are always charged and users can count on a stable AC voltage on board. The high charging capacity of the system ensures that the entire user battery bank of six MLI 24/5000 batteries connected in parallel (30 kWh/1080 Ah) can charge to 100 % within a very short time. Thanks to the ingenious internal AC transfer system included in the Mass Combi Ultra, the battery bank can also be charged fully automatically, both from the shore and with the generator. This means that Bolwerk has a kind of floating power plant on board. Lithium Ion technology was also chosen for the sternthruster because of its low weight, small dimensions and extremely high efficiency. Two high output alternators by Mastervolt, each with 150 amperes, are installed on the two propulsion engines. The corresponding Alpha Pro charge regulators ensure efficient three-step charging so that the batteries can be charged and maintained with 300 amperes also while underway. The alternators can also supply power to the connected consumers in parallel with the battery charging, allowing the running time of the generator to be reduced further. Thanks to communication via MasterBus, the Lithium Ion batteries can easily be linked to all Mastervolt charging sources, providing those sources with all relevant information on the batteries. As a result, the batteries are charged safely and efficiently at all times. This unrivalled system concept preserves batteries, which cannot be overcharged as their status is continuously monitored. Even cable losses are passed on by the batteries and compensated for by the charging sources to ensure an exceptionally efficient charging process. The Privateer 50 Bolwerk is equipped with an advanced CZone digital transfer system, allowing the entire system to be controlled with only a few buttons. The CZone system ensures, for example, that the generator automatically comes online to charge the battery bank whenever it is almost empty. Fans in the engine compartment are automatically switched on by CZone when the temperature becomes too high. 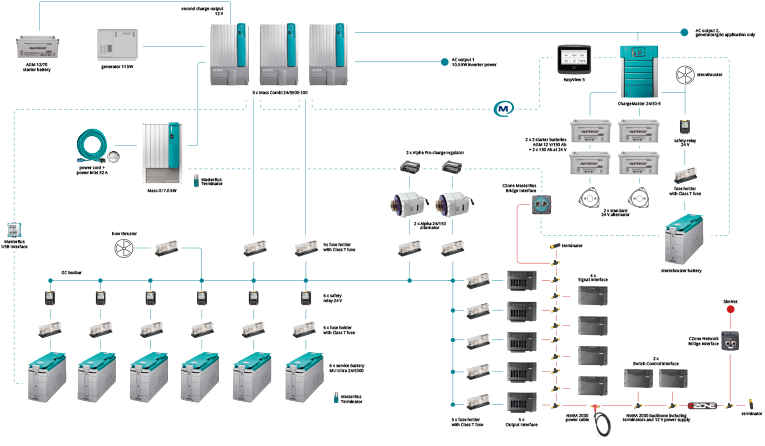 B&G navigation screens are integrated with the system. This makes it possible to operate and monitor the CZone digital transfer system and the Mastervolt power system entirely from these screens. CZone and MasterBus are linked through a CZone MasterBus Bridge Interface, with optimal transparency guaranteed! This waterproof system monitor with a screen that is legible in daylight is easy to read and operate. Thanks to the colour touchscreen and multilingual menu, the screen is a pleasure to use. The easily customisable ‘favourites’ pages display all relevant system information at a glance. 17 x fuse holders with Class T fuses.